You get what you pay for - or so I've always assumed. So as much as I'd love to be able to obtain really topnotch tea at bargain basement prices, I have to admit that I'm skeptical when anyone offers such a thing. Just as I was skeptical when I found that Boston Tea Campaign's First Flush Finest Tippy Golden Flowery Orange Pekoe (FTGFOP1) was going for $16 a pound plus $5 shipping. Tea Guy really hasn't had as much experience with Darjeeling tea as I'd like. As far as Indian teas go I've tended to focus my interests a little more on the Assam varieties. But I know enough about Darjeeling tea to know that one dollar an ounce is really cheap. Which, as I said, made me more than a bit skeptical. But, as it turns out, my skepticism was mostly unfounded. Though I don't have a lot of other Darjeeling experiences to compare this one to, I found it to be not bad at all. It has quite a light, pleasant taste. It's perhaps not quite as fruity or aromatic as some of the few Darjeelings I've tried, but it's not bad, especially if you consider the price. My only other complaint - but it's one that applies to most Darjeeling tea I've tasted - is that they tend to be a bit on the bitter side. Perhaps I just haven't yet found the optimum brewing criteria. I started out using boiling water for about 3-4 minutes and now I've got that down to about two minutes. It's still a little more bitter than I like so maybe I'll back off to 1.5 minutes, or even one. But, a pretty good experience and you sure can't beat the price. 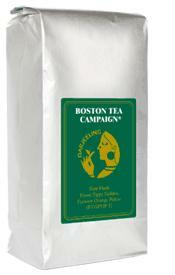 How does Boston Tea Campaign offer their wares so cheaply? As they tell it, they're "an offspring of Teekampagne, located in Berlin, Germany. 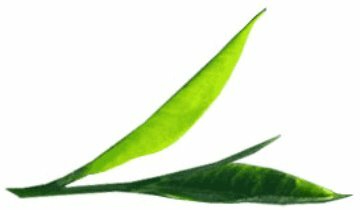 Founded 20 years ago, Teekampagne has evolved into the largest mail order tea business in Germany and become the world’s largest single importer of Darjeeling tea." So the trick here, apparently, is to offer one product and one only and to buy it up in sufficient quantities that you can sell it really cheap. But don't take my word for it. If you ask nice, BTC will send you a sample of their tea and, right now, first time customers can pick up a pound of this variety for only $10. Dear Tea Guy, thanks for reviewing our Darjeeling tea. Please visit (and contribute to?) our blog, recently established at http://blog.bostonteacampaign.com. Best regards, K.
I have the solution to Darjeeling tea being bitter. It's really not black tea. If you look at your tea leaves while brewing you will see some green color. The process of the tea is just not the same as most black teas. You need to treat it as Oolong tea. I usually go 190 degree water and seep for 4 minutes. Especially for first flush I might go 5. It is a different tea then Assam which is fully blackened.